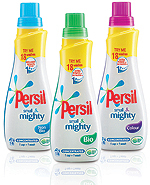 Britain’s favourite laundry brand Persil has recently launched a NEW formulation that tackles even more of the toughest stains your kids pick up and we have 10 bottles of Persil Small & Mighty to give away!! NEW Persil, with the extra cleaning power of pre-treaters, means there is no need for applying additional stain removal products before your wash. New Persil has been specially formulated to tackle stains like grass, chocolate sauce and mud, and is proven to be tough on those stains that kids pick up most frequently! Prizedraw closes Wednesday 15th December 2010. The 10 winners will be randomly selected. What a handy prize, I would like the non-bio please! I would love a bottle of Colour please! the non biological please, to keep my children nice and comfy without any irritation..
Non-bio please, I love Persil! I would love the non-bile! Hi Bio would be great to try please! I would like colour please!